In my book, Accept No Trash Talk, I discuss one of my favorite movies. It’s a 25-minute movie called Johnny Lingo. It’s set in Hawaii in the 1960s. In the movie, a young lady named Mahanna is disrespected by everyone on her island, including herself. She is often called names, such as “ugly”. Mahanna has so many dark words spoken over her that she believes them. She believes that she has no chance of a better life, no chance of making a successful marriage. All of that changes when a successful man named Johnny Lingo decides to marry Mahanna and offers an extravagant bridal gift to her father in exchange. Johnny Lingo views his future bride as a popular, desirable woman of light, so that is what she internalizes. She begins to look and act as though she is a different person. What are some Examples of How I’ve been Empowered by Words? I have played the piano in my kids’ church organization for years. I would not want to continue with this responsibility if I didn’t receive compliments. Certainly, I do not play the piano perfectly. Yet, I appreciate the fact that certain individuals concentrate on the positive aspects of my piano playing. Their kind words drive me to improve my skills because they lead me to believe that it’s possible to improve. What are some examples of how words can hurt us? I have a friend who has had many negative words spoken to her over the years. She has been criticized about her looks, her marital prospects, her beliefs, and her background. She remembers every unkind word for decades. She internalizes them and they make her physically ill. I see unkind comments on Google+ quite often. It’s true that we can’t expect everyone to agree with all of our opinions. Yet, it’s hurtful when people openly devalue our value system and beliefs. I connected with one young lady who was upset by a fellow member of Google+ who attacked her for her religious beliefs. She felt defensive. She wanted to retaliate. Recently, I was working on a project that meant a lot to me. I had spent almost two years on this project. I was proud of myself when the project was finally completed. I wanted to get my friend’s honest evaluation of the project. She gave me no positive feedback at all; she only gave me negative feedback. Obviously, that wounded me. How can we Change Negatives into Positives with our Words? I have been a substitute teacher for years. Some of the students respect authority and some don’t. However, I have found that more of the students respond to positive reinforcement than negative reinforcement. For instance, if I praise students who are being respectful, I am likely to see improved behavior among all the students. On the other hand, if I take up precious time only criticizing students who are acting inappropriately, many of the students will stop listening to me. They will consider me to be unable to control the classroom and lose respect for me. Lately, I attempted to submit a guest blog post to a certain site. This is a site that encourages people to post uplifting stories of healing and overcoming the odds. I was writing about a dark time in my life that was made even darker by the disrespectful, neglectful actions of two people. I have been bitter towards these people for decades, and that came through in my words. The owner of the site kindly suggested that I use less judgmental, accusatory words about these individuals. How can we use Words to Heal People? 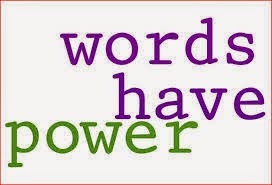 The amount of words that we use to encourage people is unimportant. What’s important is that we take the time to notice somebody, to show that they matter to us. Time is money in this day and age. When we give people our time by honoring them with our words, they are appreciative. What are some positive words that you have used lately?